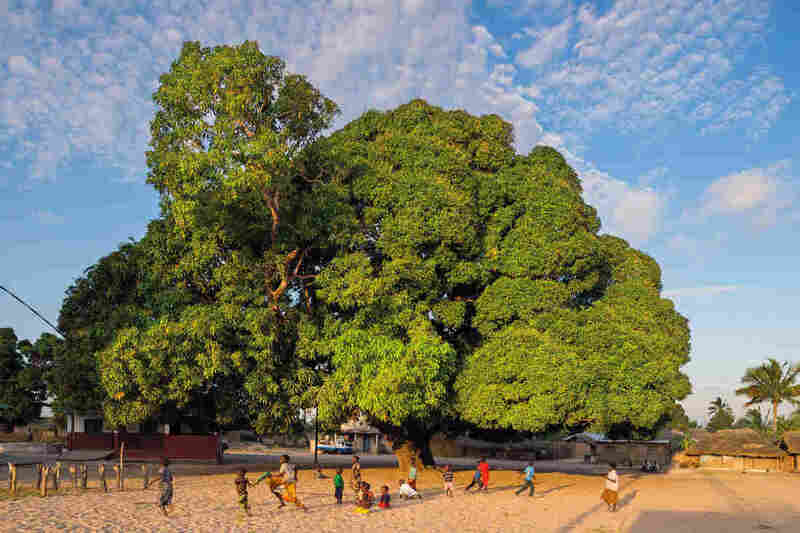 The Book 'Wise Trees' Has Photos Of Extraordinary Trees Around The World : Goats and Soda In Wise Trees, a book by photographers Diane Cook and Len Jenshel, you'll see a holy tree in the middle of an Indian candy shop, a communal tree in Mozambique, a tree of tragedy in Cambodia. The Sardar Sweet Shop in Varanasi, India, was built around a neem tree considered too holy to cut down. 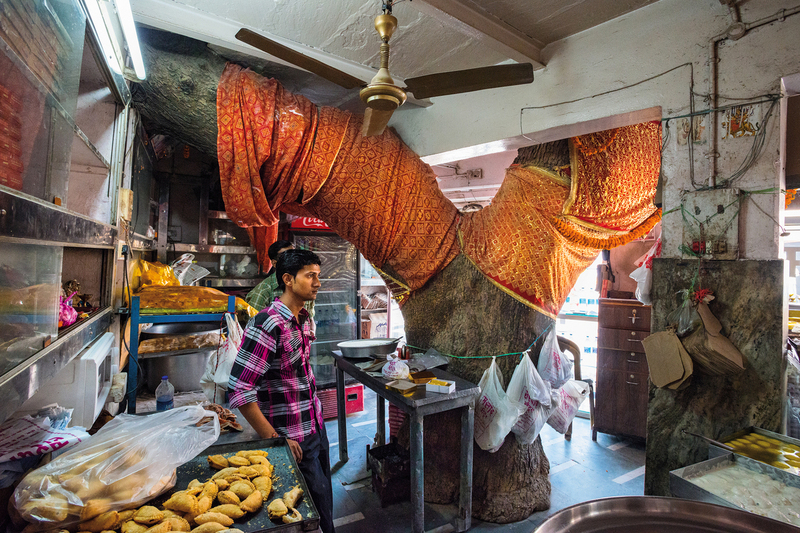 Customers flow in and out, barely noticing the imposing tree. In rural parts, people use the neem tree's leaves to repel insects, the sap for stomach pain and the branches to brush their teeth. As for the candy shop sweets, Diane Cook says they were "fabulous." Not long ago, two Americans caused a scene in a Mozambique village. 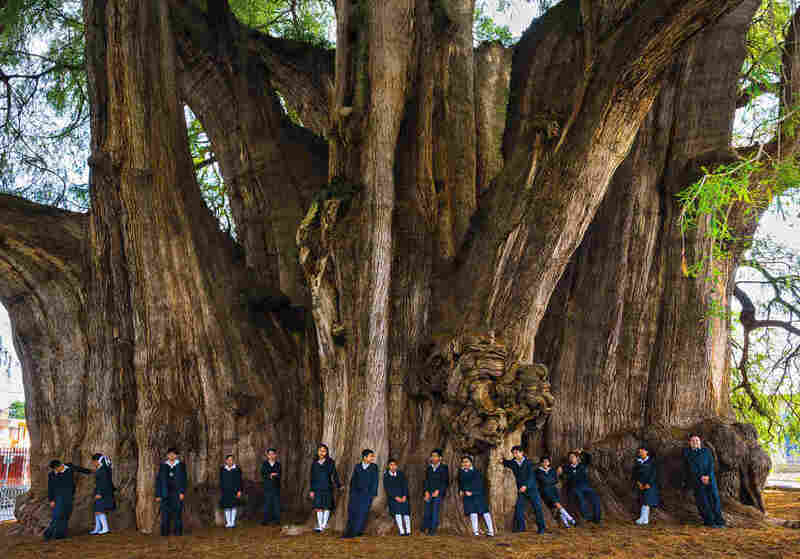 Locals were mystified by the tourists spending several days photographing a single tree. "Sometimes we have to explain to people what we're doing but often they just think, 'Okay these guys are nuts,'" says New York photographer Len Jenshel. He and fellow photographer Diane Cook spent three years making Wise Trees, a book of tree portraits. The first photographs were taken at a place once known as Ground Zero. There they documented the blossoming "Survivor Tree," a Callery pear that had been pulled out of the ruins of the World Trade Center weeks after the terrorist attacks on September 11, 2001. Burned and broken, the tree was nursed back to health and re-planted a decade later at what is now the National September 11 Memorial. Cook and Jenshel have worked together since 1991. A husband and wife team, they met years before "through cannoli, not cameras." For the book, she undertook the research while he sweet-talked their way into getting permission to photograph trees that were on private property. 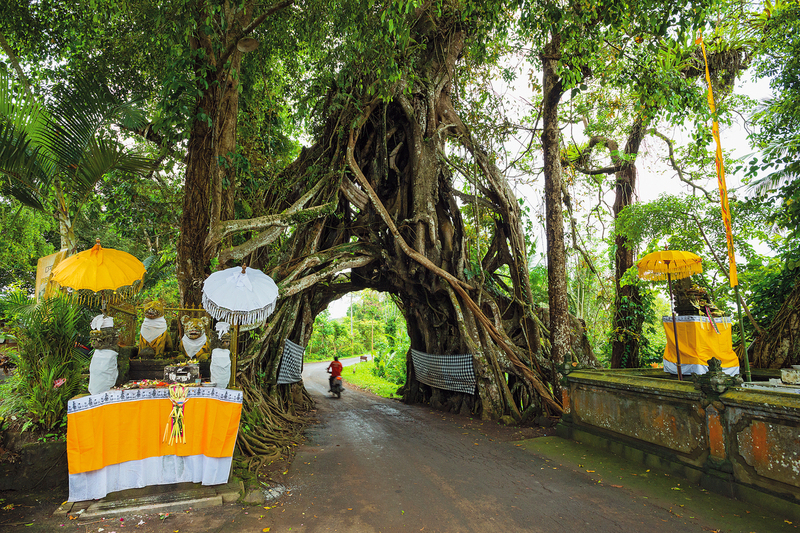 A road runs straight through Bunut Bolong, a sacred banyan tree in West Bali. Engineers insisted the land the tree grew on was the best place for the road, so Hindu worshippers — who are forbidden from cutting down holy trees — prayed for forgiveness for the giant hole. 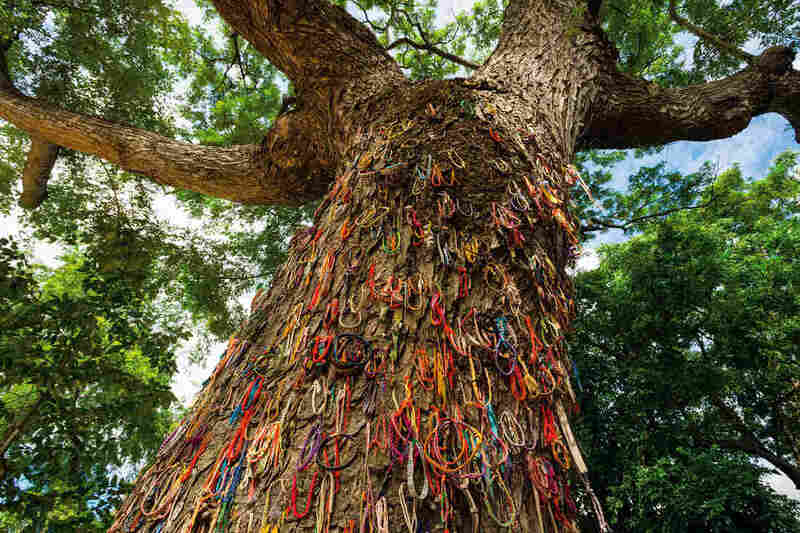 "Even though this is a busy roadway in steep terrain, people actively come and worship this tree," says Diane Cook. And then came the challenge of making pictures. "Technically every tree poses a new challenge on how to photograph it," says Jenshel. They had to consider lighting, season, angle and how close or far away to shoot to capture each tree's most significant traits. The idea was born on a night in 2012. The couple was photographing cherry blossoms after dusk in Japan. Cook got a call that her father in the United States was dying. They watched pale white petals from the trees float away in the wind. "We looked at this amazing ritual of life and renewal, which happens every spring," says Cook. "And somehow, when we came back from that trip, we started thinking about the wisdom that we get from trees." The trees featured in their book offer shade and solace. Some give guidance, like a tree Native Americans once used as a reminder to leave one river and cross to a different waterway. 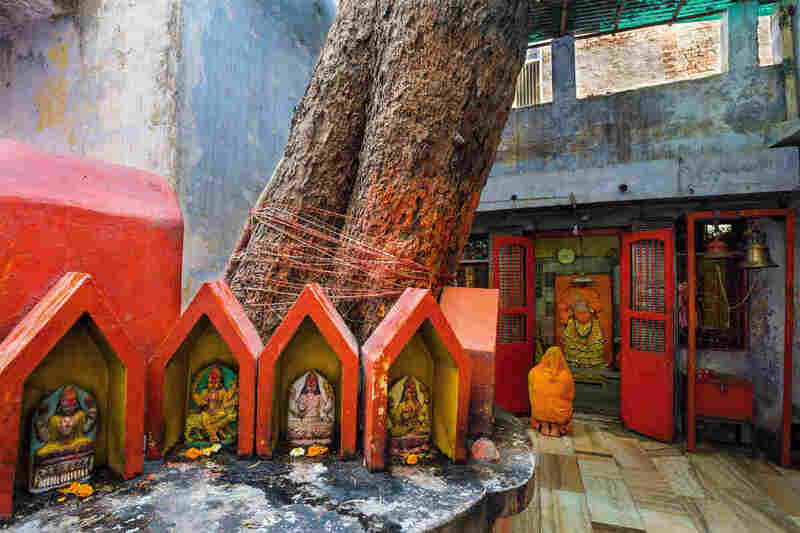 Others are seen as a source of healing, like sacred trees in India. And a few have been silent witnesses to humanity's darkest times. Both Jenshel and Cook say the hardest tree to photograph was what became known as the Killing Tree in Phnom Penh, Cambodia. During Pol Pot's brutal reign, prison guards held babies and children by their feet and smashed their skulls against the tree. Sometimes mothers were forced to watch before they were killed, too. "We kept it together while we were there in the field but it took us weeks to recover from photographing that tree," says Cook. The book — published by Abrams in October — features images taken in 11 countries as well as the United States. 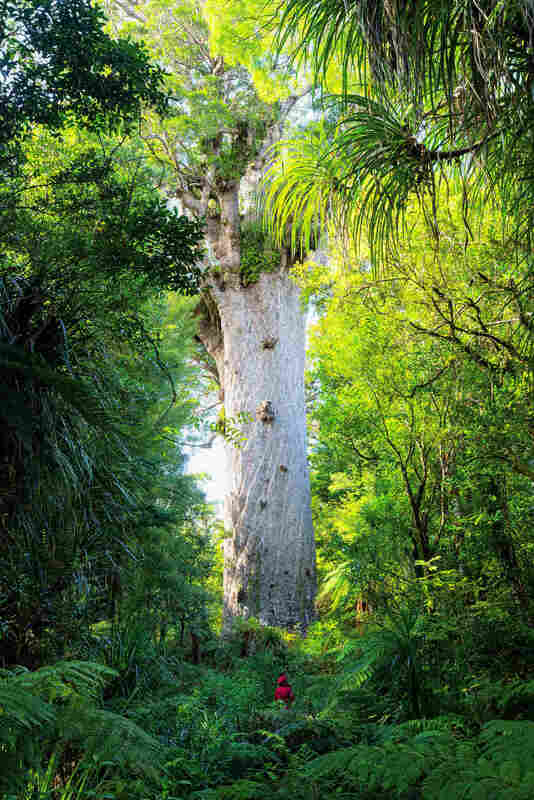 We've selected photographs that were made in the developing countries that Goats and Soda covers as well as New Zealand, where one kauri tree contains special meaning to the indigenous Maori people. Sasha Ingber is a multimedia journalist who has covered science, culture and foreign affairs for such publications as National Geographic, The Washington Post Magazine and Smithsonian. You can contact her @SashaIngber.